Training Talk: How do you treat injuries in an active mass casualty event? In the aftermath of the horrific and cowardly attack in Las Vegas this week, I put myself on a mandatory commentary blackout. The reason I did so was to prevent idle speculation without solid facts, and if you followed any of the news stories you know how far off the mark the first day or two of reporting was! I’ve taken the intervening time to study the event in as much detail as is possible at this point, and on Monday I’m going to share with you my observations, recommendations, and caveats to help you protect your own life. It’s a post you’ll want to read thoroughly and share. In the meantime, though, one of the things that really stood out about this event was the importance of immediate medical response. By ‘immediate’, I mean faster than paramedics can get to the scene. That means life-threatening trauma care needs to be started by the people who are already there. Each of us needs to learn how to initiate life-saving trauma care, on both ourselves and others. In the case of the Las Vegas incident, it also means doing so while in the midst of an ongoing attack. It’s not easy, and there are some things you need to know beforehand. To help everyone learn more about this subject, I had Caleb Causey of Lone Star Medics on the show last night to talk about trauma care while under fire. It’s Caleb’s specialty, and he didn’t disappoint. Be sure to listen to the whole show; Caleb packed a lot of good information into the hour! Hey Buddy!, I found this information for you: "Training Talk: How do you treat injuries in an active mass casualty event?". 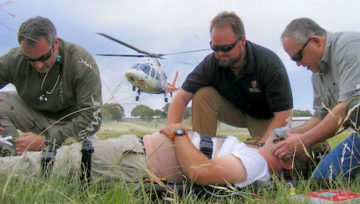 Here is the website link: http://www.grantcunningham.com/2017/10/training-talk-treat-injuries-active-mass-casualty-event/. Thank you.